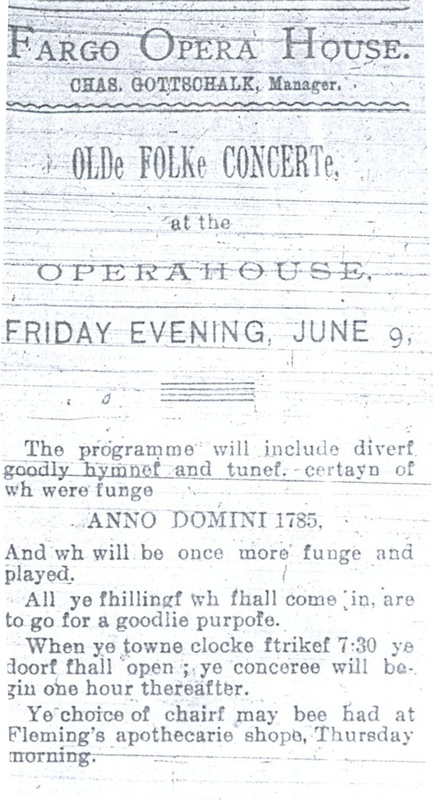 Ad for the Fargo Opera the night of the fire. This show would not go on. The first opera house of Fargo received little respect in its early years for either presentation or design. In November of 1890, Alex Stern and Harry O’Neill offered to build a new opera house for Fargo if the city would provide aid. Stern repeated this offer as late as February of 1892, still hoping to provide a new opera house for the growing city. A theater manager from Minneapolis, Charles A. Parker, acknowledged that Fargo had a good reputation for theatre, but such a reputation was significantly inhibited by the lack of a “handsome theatre.” Plans for rebuilding were discussed, but were not fully implemented. 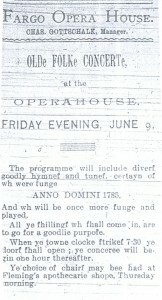 The Fargo Forum on June 7, 1893 announced that there would be an Olde Folke Concerte at the opera house on June 9. The events of June 7 would force that particular show to be postponed.The fire that swept through the city caused $2,000 worth of damage for the manager of the Fargo opera, Charley Gottschalk. The downtown area of Fargo received far greater damage, but the opera house provides an invaluable opportunity to examine the rebuilding effort. As was typical for Fargo businesses following the fire, the opera house would only be out of operation for a short period. Before the end of June, Gottschalk announced his plans for a temporary opera house on Broadway between First and Second Avenue. A crowded house showed up to watch Paige’s Players present Man and Master on July 3, 1893. Though it was obviously only a stopgap measure, the reviewer for the Fargo Forum still thought it was an improvement over the previous location. Numerous productions were held in the temporary location, until winter came and the temporary location found itself redesigned as an ice rink for the winter. By September, Fargoans established plans to build a new opera house to replace the old one. Initially, the backers planned for it to be built on the Keeney block owned by Mr. N. Stanford and Alex Stern. Stanford had put forth the plan, but Alex Stern once again put himself forth as one of the primary advocates. Stanford requested that $5,000 be raised for him to build the opera house, and Stern quickly agreed to provide the first $100. The Fargo Board of Trade took up the plan, though the amount needed had been raised to $7,000. Stanford backed out of the plan, but was replaced by Mr. Hagaman. The overall price settled on was $7,500, and Walter Hancock acquired as the architect. The eventual site agreed upon by the Board of Trade was Second Avenue North, a block west of Broadway. Construction began quickly on the new location, with Hancock taking the initiative. Alex Stern, one of the largest backers, attempted to view the construction of the opera house and was told to leave. Stern noted that this offended him, but he maintained his support for the opera house. By May of 1894, the new opera house opened up to notes of praise in the Fargo Forum. In regards to the lighting, the Forum noted that the new opera house was one of the best equipped in the United States. As with many other businesses, the opera house had risen stronger than it was before. Fargo Forum (Fargo, ND), November 14, 1890. Fargo Forum (Fargo, ND), February 16, 1892. Fargo Forum (Fargo, ND), May 28, 1892. Fargo Forum (Fargo, ND), June 8, 1893. Fargo Forum (Fargo, ND), June 19, 1893. Fargo Forum (Fargo, ND), July 5, 1893. Fargo Forum (Fargo, ND), October 14, 1893. Fargo Forum (Fargo, ND), May 14, 1894.